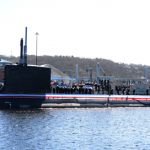 The U.S. Navy has commissioned USS Colorado that was built by General Dynamics‘ Electric Boat subsidiary as part of the Block III Virginia-class submarine program. Cmdr. Reed Koepp II will serve as commander of the submarine designated as SSN 788 and sponsored by former Navy Secretary Ray Mabus’ daughter Annie, the service branch said Saturday. USS Colorado is designed to support anti-submarine; anti-surface; irregular; intelligence, surveillance and reconnaissance; mine and strike and special operations forces delivery missions. The Navy noted its new submarine features a nuclear reactor plant and can travel submerged at more than 25 knots. SSN 78 also includes two large-diameter Virginia Payload Tubes built to launch up to six Tomahawk cruise missiles each and two photonic masts with visible and infrared digital cameras.